Managing ocean resources is a global responsibility that requires focus and perseverance. Thirty percent of the world’s fish stocks are overexploited, threatening fish and plant species and the ability of people who depend on marine and coastal biodiversity to earn a living and feed their families. Photo: NaniP/Shutterstock. March 3rd is United Nations (UN) World Wildlife Day. This year’s theme “life below water: for people and planet” encourages people and institutions around the world to celebrate and raise awareness about ocean plant and animal species. On this occasion we are featuring a story on the GEF’s Pacific Islands Oceanic Fisheries Management project. The project was implemented by UNDP and brought multiple benefits for Small Island Developing States (SIDS) and marine biodiversity in the Western and Central Pacific. The world’s oceans are a vast mystery. For centuries, people have been on a quest to cross, dive deep into, and understand them – and there is still a long way to go. Ocean species have shown civilizations how to navigate and harvest these waters; more than three billion people depend on the oceans as a breadbasket, providing food and employment. Oceans cover 75 percent of the world’s surface and regulate the planet in ways both intricate and profound. Considering the ocean’s role in climate regulation, the dangers of ocean acidification, and human interdependence with ocean species, it is important to consider what is at risk when activities threaten ocean health and biodiversity. Managing ocean resources is a global responsibility that requires focus and perseverance. Thirty percent of the world’s fish stocks are overexploited, threatening fish and plant species and the ability of people who depend on marine and coastal biodiversity to earn a living and feed their families. As is the case in many situations like this, those most severely affected by environmental degradation see the least financial return from these activities and have the most to lose if the resources are exhausted. The Western and Central Pacific Ocean is home to over half the world’s tuna stocks and 15 Small Island Developing States (SIDS) that are dependent on tuna and other ocean resources. 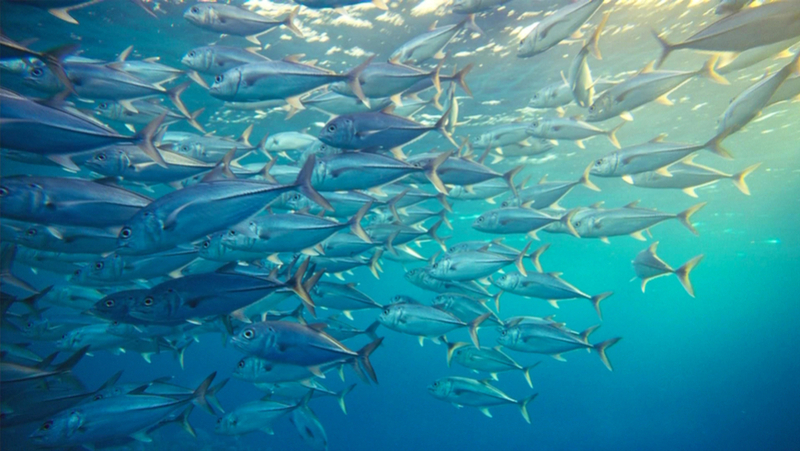 Tuna, like a number of open-ocean species, are migratory and their migration patterns cover huge swathes of the ocean, traversing more than 20 countries’ jurisdiction and international waters. They are in high demand around the world – they fill sushi rolls, top poke bowls, and provide convenient canned nutrition. But a patchwork approach to managing and enforcing sustainable fishing practices in this region is challenging, especially for countries that rely on donor government funding to cover costs. The GEF works with SIDS in the Pacific to help them develop practical and cost-effective solutions to sustain the natural resources that underpin the lives of their people. Many of these islands share sustainable development challenges such as rapidly growing populations, limited resources, and fragile environments that are vulnerable to shifts in climate and global economics. The equipment and coordination necessary to successfully track and police illegal fishing is often beyond the capability of these states. In 2005, together with the UNDP, the GEF launched the Pacific Islands Oceanic Fisheries Management Project in the Western and Central Pacific Ocean region focused on building cooperation between SIDS. This project also developed the skills and technology to track and manage tuna stock in these countries more effectively so that the people living there would be able to benefit from the resource for years to come. The goals of the project were two-fold: change behaviors to reduce over-fishing and shift the benefits of this industry to the people living in the region. In line with these goals, the GEF was able to support states as they reduced illegal, unregulated, and unreported fishing while improving the lives of people who rely on this industry for subsistence and employment. The GEF focused on increasing the SIDS’ ability to coordinate and negotiate, and this has led to shifting the costs of managing and enforcing the fish stocks to those partners that profit most from this industry rather than those who depend on the oceans for subsistence. For example, this project allowed for better vessel tracking that improved the ability of regulators to enforce stricter fishing measures, stop illegal fishing, and charge commercial vessels increased access fees. As a result of this program, fish stocks in the region have rebounded, leading to an increase in legal catches by almost 60 percent in national waters between 1997 and 2012. These increases have contributed to the economic vitality of the SIDS. In seven SIDS the management of fisheries led to a jump in fishing’s contribution to GDP ranging from 50 to 1,000 percent. This growth is critical as tuna catches make up 10 percent of regional GDP, and jobs related to tuna fishing – working on fishing boats, processing, and canning – make up 6-8 percent of all wage employment. In addition, the number of people hired to work in local processing facilities doubled between 2002 and 2008. In the Solomon Islands, this translated to employing around 1,700 people, 65 percent of them women. The local processing of the tuna ensures that each state captures a greater share of the profits from this industry. Despite project successes, tuna is not off the chopping block. While the Western and Central Pacific region is seeing improved regulation, enhancing the Pacific SIDS’ abilities to manage fisheries is ongoing. The Discovery Channel Asia aired a film that describes the context, initiatives, and impacts of this project. Check out the short trailer of this film on Vimeo to learn more.